More about iittala Toikka Polar Night Owl (Male) The iittala Toikka Polar Night Owl not only perfectly captures the wonder of winter, but epitomizes the creativity and craftsmanship of Professor Oiva Toikka and his team of glassblowers. This is the male counterpart of a mated pair. Hand-painted facial features add dimension and personality to the otherwise opaque white piece. 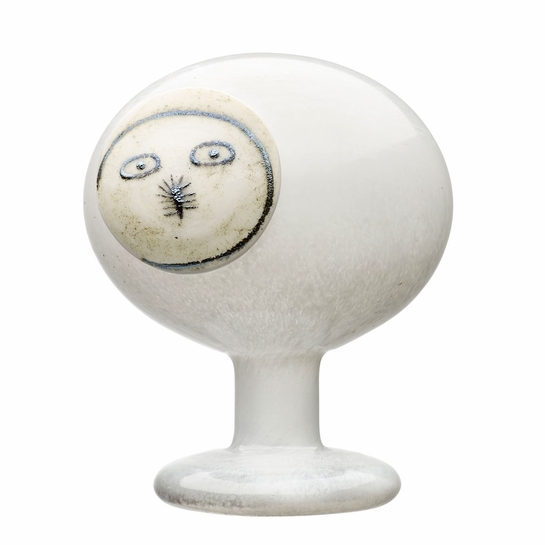 The minimalist round shape on a footed pedestal is a refreshing variation in the collection yet stays true to the Scandinavian style of Toikka's Finnish roots.Slightly protruding, the face piece is applied by hand after the piece is mouth blown in Finland. Each unique iittala Toikka Polar Night Owl carries �O. Toikka IITTALA� on its base to ensure authenticity.